Grappling with the Statue of Liberty and Brexit in one English exam proved too much for more than 30,000 German school students, who are protesting in an online petition. They say the texts they had to analyse were "unfair" - stuffed with highly literary and outdated vocabulary. 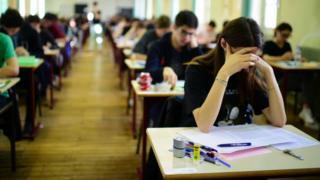 Baden-Württemberg state officials, however, called the texts "appropriate" and defended the exam board. They were part of the teenagers' crucial Abitur school-leaving exams. One task was to comment on two contrasting cartoons about Brexit, titled "Project Fantasy" and "The Realities". That required some current affairs knowledge, besides English comprehension. But it could be argued that German teenagers ought to take an interest in the UK's exit from the EU. At least they were not asked to comment on the Common Agricultural Policy. About 31,000 students sat the English exam in the south-west German state but the petition launched last month has collected more than 35,000 signatures. They ask the region's education authorities to adapt the marking system in light of the "unfair" difficulties posed by the texts - and give some examples. This year's Abitur "is not comparable with those of previous years", they argue. One passage the students had to wrestle with had this challenging description of the Statue of Liberty: "Against the luminous sky the rays of her halo were spikes of darkness roweling the air; shadow flattened the torch she bore to a black cross against flawless light." The petition also complains that a 1934 text from Henry Roth's novel Call It Sleep had antiquated English and the written task was not clearly explained. The Abitur papers were designed and distributed by the Baden-Württemberg education ministry but the Abitur is a national exam - Germany's equivalent to the UK's A-levels or France's Baccalaureate. The region's culture minister, Susanne Eisenmann, said: "I have full confidence that the teachers will exercise their judgement when marking to the fullest degree and responsibly." One of the region's top linguists, Bernd Saur, said: "I urge the pupils to await their results - nobody's going to get a whacking." Last year there was a dispute about another school English exam, in the western German state of North Rhine-Westphalia. The exam marks were revised after an online protest petition. Students complained that the exam had included a poor recording of Prince Harry "mumbling" in a speech.